Mrs Gale, We're Needed (To give British TV a Kick Up The Rump). Dave Rogers. Ten pages. The tortuous route of the Honor Blackman repeat seasons on Channel Four and A&E. Read All About It. The Avengers Are Back. Dave Rogers. Two pages. How the Dave Rogers / John Peel 'Too Many Targets' paperback came to be written. The Avengers: Strip For Action. Dave Rogers. Four pages. 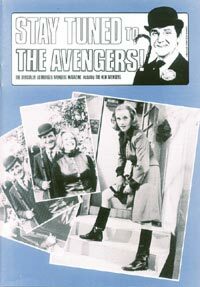 Very brief overview of past Avengers comic strips acts as an introduction to the about-to-be published Eclipse 'Steed and Mrs. Peel' comic book. It's So Nice To See You. Dave Rogers. Ten pages. Linda Thorson Q&A session from Visions 90 TV Convention.